Glass recycling is a common practice, and many communities include glass bottle and container collection in curbside collection programs. (To read my introduction to glass recycling, click here.) Recycled glass is sought by the glass packaging industry as it requires less energy to process, and therefore is more cost effective than virgin glass. When it comes to the importance of recycling glass, here are four compelling points to consider, offed by Pace Glass. Glass containers for food and beverages are totally recyclable. Other glass products such as windows, ovenware, Pyrex, crystal, etc. are manufactured differently. If such materials find their way into the glass container manufacturing process, they can result in production problems and defective containers. Approximately 44 glass manufacturing plants operate in 21 states. According to the Glass Packaging Institute, 63 glass beneficiating facilities across the country. At these glass processing plants, recycled glass is cleaned and sorted, prior to being resold to glass container manufacturing companies for remelting into new food and beverage containers. On average, a typical glass processing facility can handle 20 tons of color-sorted glass per hour. 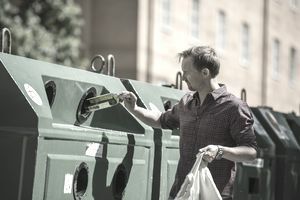 States using bottle bill programs, in conjunction with single stream (one-bin) programs, can increase the beverage container recycling rate by 11%, and the overall recycling rate by 162%.